In places, it’s the Dickensian picture book backdrop that we all think of when we imagine the perfect Christmastime. After nightfall, the cobbles glitter by the reflection of twinkling lights, the windows of pubs glow mistily in the cold evening air, and shop windows promise all sorts of magic and mysterious parcels come December 25. Clusters of star-balls sit high in trees, and punctuate strings of illuminations which guide shoppers on their way through the historic streets. High on the hill, the Medieval backdrop of Norwich Castle is animated by sequences of festive projections which dance late into the night. 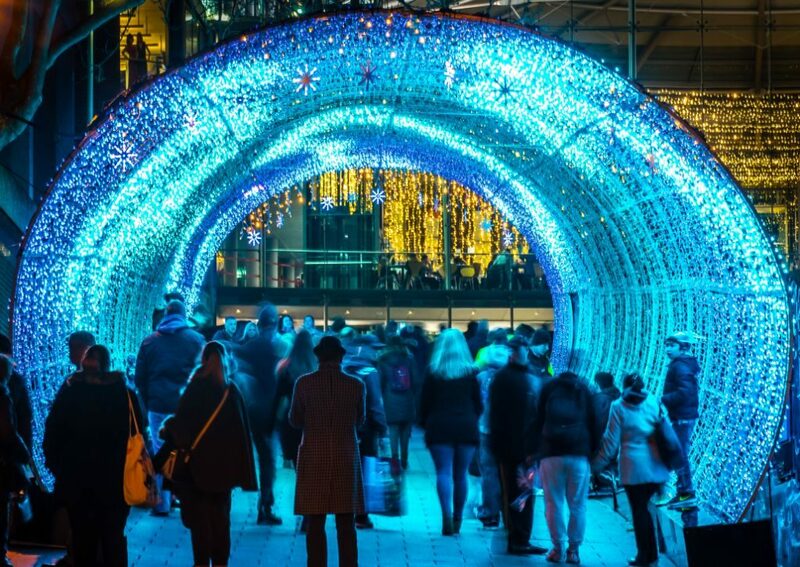 From November, through December and into January, the city is a spectacle not to be missed, and for the last two years, the magnificent centrepiece of Norwich’s Christmas programme has been the Tunnel of Light. A UK first when it opened in 2016, the tunnel with its 45m promenade of 50,000 dancing LEDs throws colours spinning into something amazing, immersive and quite beautiful. In 2018, the tunnel will be returning once again to its home on Hay Hill. The Forum houses the annual four-day Christmas market – Festive Fair at the Forum – during the last weekend of November, and is the ideal destination if you’re looking to kick-start your shopping. Add to that Norwich’s perfect mix of eclectic independents and high street retailers, and you’ve got the ideal place to pick up gifts for all your friends and family.